At least in New York Magazine Eloise moved to Brooklyn a couple of years ago. Before Chippendales, or Magic Mike, the way to get a bunch of handsome men to dance around in tuxedos appears just to have been wacky/cruel radio star Kay Thompson. Judy Garland's best friend, Liza Minnelli's godmother, and vocal guru to Frank Sinatra, she was a tour de force. Thompson also devised the character and the text for the greatest hotel book of all time, Eloise. She was apparently also a total control freak. Go figure. An equally important part of Eloise, and of course of Eloise, is the way she, the princess of imps, looks - and the way the Plaza looks to her. The hotel isn't just a stuffy old institution*. The entire thing is her very own home. It's not just for this that Lena Dunham's new documentary about illustrator Hilary Knight is pretty amusing. A bit of an Eloise himself, Knight's imagination is just as powerful as the less interesting world that surrounds him. It's also nice to hear that Dunham (and Tavi, and Mindy Kaling) simply adore Knight's and Thompson's Eloise just as much as you and I do. Anyway, it's only 30 minutes and to celebrate the book's 60th birthday I think you should watch "It's Me, Hilary." I am all for the real thing, but find Eloise-inspired bedrooms rawther gross. Eloise, who finds glamor in the fanciness and detritus around her just as she does in adulthood - and in the weird preoccupations of grown ups, their ways of speaking, their accessories, the things they discard. 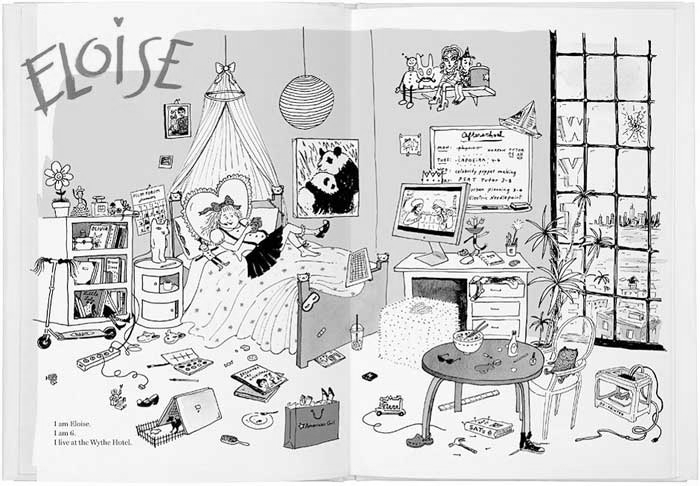 Eloise, the guide to how one should be bad and fun and interesting all at once. Eloise, who lives in the Plaza and turns it inside out. *It was built in 1907, so basically fifty years old when Eloise came out.